Today we take a look at what is perhaps the most famous house in Pennsylvania, Fallingwater. This is easily the most famous and highly lauded creation of Frank Lloyd Wright, one of the twentieth century's most highly acclaimed architects. The building was built in 1935 for the Pittsburgh retail mogul, Edgar Kaufmann of the former Kaufmann's Department Stores. The place is an architectural wonder, and was designated as a National Historic Landmark back in 1966. Not only is Fallingwater a favorite for all visitors, it has received high accolades by major organizations, including the American Institute of Architects, the Smithsonian, and others as one of the finest pieces of American architecture. Who would have known that such a building would be located right here in Pennsylvania, in rural Fayette County. The building was constructed to be one with nature, being located at the pinnacle of a waterfall. Kaufmann wanted the building to be built at the bottom of the falls, and facing towards them. Frank Lloyd Wright is said to have drawn up the bulk of the plans within two hours, upon having the information regarding a survey of the land and its boulders. The building is located deep in the woods. The interpretive center and parking area are located a short hike away from this magnificent structure. Here you can see the placement of the structure right over the creek. The stairway leads down to a view of the water. There are multiple patio areas, bedrooms, and living areas that all afford stunning views of the surrounding landscape. The view looking down upon the falls from the closest balcony. Yeah, can we live here please? The fine details of this building are so intricate and beautiful. The design strangely feels like a part of the landscape, as if it were always there and just belongs in this location. It is breathtakingly beautiful. Looking down upon portions of the building and how it interacts with the beautiful scenery of the area. You can just imagine how great it would be to sit out here with a book, or to simply just listen to the sounds of the waterfall and the woods. This is one of those times that you wish you could capture smells in a photo. There is nothing quite like the smell of the woods after the leaves start falling down. Such a crisp and invigorating smell. A view from the main patio area. Kaufmann was known for throwing parties at the house, and you can just picture how this would be the perfect setting for one. Touring this building is a real treat and I highly recommend that you take a tour yourself. Another extremely impressive aspect of this design is the amount of height that is achieved. When you are on the upper levels, you feel really high up, like you are a part of the tree canopy. The covered walkway up the hill to the servant's quarters and garage. This spot in the back of the building shows how spectacularly the building's cantilevers were built into the boulders of the property. The Western Pennsylvania Conservancy had to to some serious reinforcement of these cantilevers, because upon initial construction they were insufficient. We loved our visit and tour in and around this magnificent structure. You need to get a full tour of this architectural wonder at some point. Walking the grounds is fun, but the insights you get with a tour of the inside of the structure really show you how impressive of a structure this is. If you want to see more waterfalls in the area, be sure to check out nearby Ohiopyle State Park. This is a stunning area to check out, especially during the autumn season. 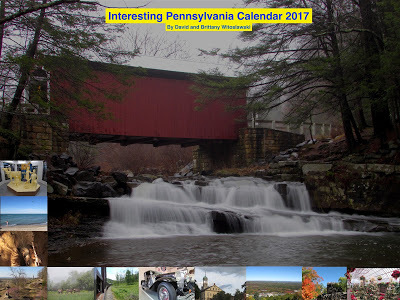 Be sure to check out our Interesting Pennsylvania 2017 wall calendar, available through the drop down menu at the top of this page, or through this link. It is available on early-bird special for free with purchases of our book through the page, or individually for $9.99 plus shipping.